Bankvale Run is a destination restaurant on a working cattle farm and winery. It sets the tone for the ambitious redevelopment of Mickelham’s Marnong Estate Farm into a showcase of Victorian food culture. Natural materials, intimate zoning and views worth lingering for create a welcoming ‘local’ with high-end appeal. The design delivers a 200-seat hilltop restaurant linked by a glazed atrium functions area to a converted heritage homestead offering accommodation. An inherited façade, building envelope and planning approvals informed the approach. The brief was to attract daytrippers from interstate and overseas looking for high-end winery dining as well as locals keen to let the kids run free and while away afternoons with friends and family over pizza and wine. Designers drew on the owner’s Italian heritage and love of relaxed dining in local piazzas. The 510-square-metre space is zoned for private, formal and general dining using an earthy palette inspired by surrounding farmland and vineyard. 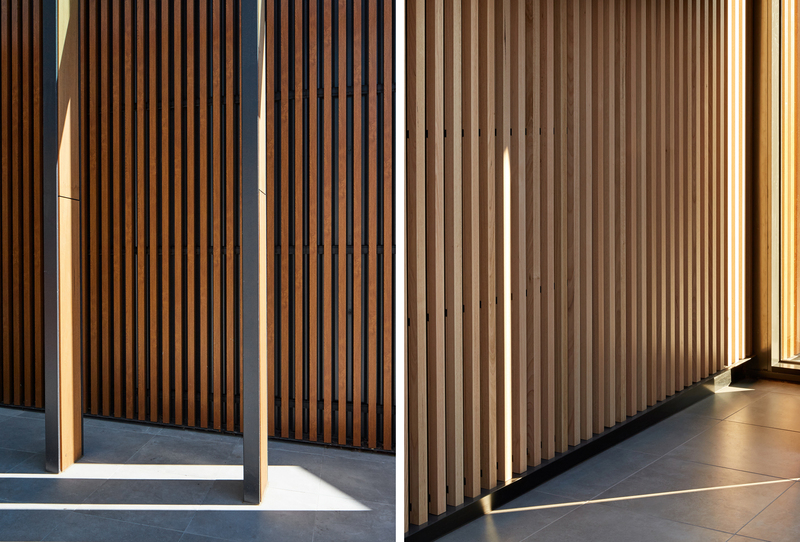 Timber battens on walls and ceilings link interior and exterior and inject warmth and intimacy. Clusters of terracotta pendants glow softly with rustic materiality. High-backed leather booths zone space with lounge-style comfort, augmented by subtle woven wicker screens and natural planting. Private dining is cleverly carved out using dark, moody walls and finishes, an enticing open fireplace topped with a screen of logs salvaged on site, and bespoke storage creating a wall of wine. Layering natural materials over black negative space focusses attention on mesmerising floor-to-ceiling views (and theatrical kitchen sightlines for private diners). Long term, treatment of restaurant and adjacent wedding/events area requires timeless appeal that will endure as the rest of the development takes shape. 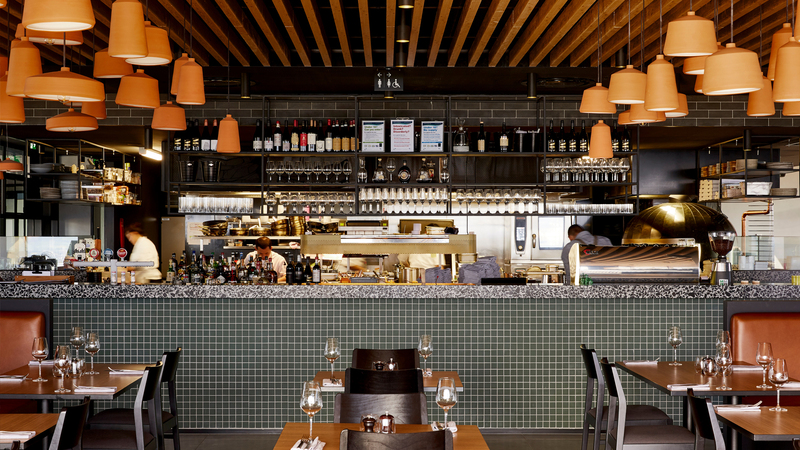 For now, Bankvale Run establishes the estate as a city-fringe foodie and functions destination and offers an important taste of things to come. The design solution delivers a complex brief with potentially conflicting aims: casual and local, relaxed and high-end, contemporary but heritage inspired, large-scale and spatially efficient but intimate and welcoming. Astute zoning with natural materials helped designers deliver every requirement and avoid the potential pitfall of blanding out through trying to be all things to all people. Designers approached the ambitious brief like winemakers, expressing the distinctive terroir of Marnong Estate with refined, earthy materiality embodying the farmland. Green bar tiles channel the palette of the property’s historic homestead. Terrazzo tiles reference the owner’s ancestry and piazza concept. Natural hues and illuminated terracotta bring the exterior inside. Bankvale Run is named for the original farm and the owner’s Black Angus cattle star on the menu. A Chris Love-designed kitchen places a contemporary pizza oven at its spiritual heart. Designers seized the opportunity for an internal feature window inviting private diners into the restaurant’s industrious hub.